The 36-year-old midfielder was part of the Celtic squad when the Hoops won the title on the last day of the 2007/08 season with a 1-0 win over the Terrors on Tayside, thanks to a Jan Vennegoor of Hesselink winner. 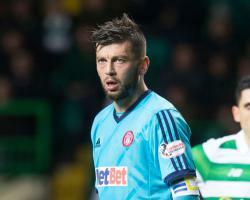 Donati, an unused substitute that night, remembers the occasion fondly and is looking for another positive outcome with Hamilton although he rates United, who have come through play-off ties against Morton and Falkirk. He said: "In my first season with Celtic we won the league at Tannadice. "It was the last game of the season and hopefully it is a good place to go again. "We know the two games are so important. "We know we are playing against a good team who have had a good season so we are concentrating on doing a good job. "They have had good results but that is in the past, every game is different. "We know have 180 minutes to do a good job and we are preparing for that." During his two years at Celtic Park the Italian played in the Champions League against Shakhtar Donetsk, AC Milan, Benfica and Manchester United. However, he insists the play-off matches with Accies - the second leg is at the SuperSeal Stadium on Sunday - are just as big. He said: "Yes, because for me, what I had in the past is in the past, it is done. "Now I am just focused on these games and for me they are really important games and big games as well. "It is important for me (to stay in the Premiership) but important for the other guys as well. "This club has been in the Premiership a few years now and it is important for the young players to stay in the Premiership to show their talent."